The 2012 ABT Audi AS6 Avant is a delight to drive and is definitely one of the best luxury cars you must add to your garage. According to Hans-JürgenAbt, Chief Executive Officer the ABT AS6 Avant is an estate of power and luxury. ABT Sportsline has done an amazing work on the car exterior and the tuned AS6 Avant looks quite elegant and sporty. The Avant features a front spoiler in addition to a rear spoiler which helps to improve the aerodynamics of the powerful car. 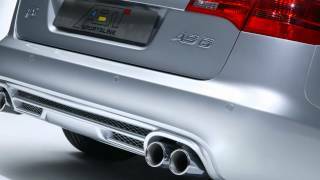 When you look at the rear portion of the Avant you will surely notice the four exhaust pipes that further establish the potential power of the luxury car. The tires are another car accessory that can help your car stand out and they are supposed to be available 21, 20 and 19 inch sizes. 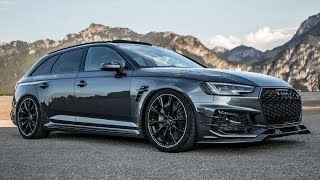 If you wish to extract the best performance from your AS6 Avant you should opt for the custom alloy wheels with high-speed rubber tires that also improve the traction. The ABT AS6 Avant is offered with different choices of engines which provide more horses than the standard units equipped with Audi version. For instance compared to the series standard 3.0 TDI unit which produces 204 HP the tuned ABT engine unit produces 240 HP. Also the ABT POWER custom 3.0 liter turbo diesel produces a power output of 300 Horsepower which is about 55 HP more than the standard version. If you wish to have the best possible AS6 Avant imaginable then ABT will equip the car with an enhanced V6 engine that runs on gasoline and can generate a tremendous 420 HP. A major plus point is the Avant’s acceleration as it takes only 5 seconds to go from 0 to 60 miles per hour. The AS6 Avant is certainly self-confident, no question. But it also acts elegant and classy, and looks just as good outside the opera as well as at the car park of the Nürburgring. The fact that its home is originally on the race track is clear from the three swift letters: A-B-T. The performance data speaks the same language: the most powerful turbo diesel with three litre cubic capacity provides 300 HP/221 kW thanks to ABT POWER (series-standard: 245 HP/180 kW). The weaker version of the 3.0 TDI now provides 240 HP or 177 kW (series-standard: 204 HP/150 kW). The AS6 Avant provides the maximum sports combination with the performance-improved V6 gasoline engine: the Kempten engineers have conjured up a huge 420 HP (309 kW) from the basic version’s sporty 300 HP. The versatile premium class fun estate, is also capable of a strong sprint: the ABT AS6 Avant sprints from 0 to 100 km/h in exactly five seconds. Optically the estate looks decent and extravagant, and appears confident and powerful from all sides: the sidebars and front spoiler harmonise with the elongated contours of the vehicle. The crowning feature is the rear spoiler and the rear apron set with four exhaust pipes. The design of the ABT AS6 Avant also includes light-metal designer wheels, which are available in 19, 20 and powerful 21 inch sizes. It goes without saying that ABT also offers alloys in combination with high-speed tyres which suit the car’s performance potential. Whatever engine the customer chooses – he/she always gets a balanced vehicle which meets the highest demands: everyday reliability and suitability for long journeys in combination with maximum sportiness characterise the new ABT AS6 Avant. After all you don’t want to go without comfort and luxury just because you are in a particular hurry.